Then we talked about his government, he’s young and he’s surrounded by young advisers, they don’t have the political experience and knowledge to advise him properly, someone should have said “No, you need to actually go to Ayotzinapa, not meet them half way, these families are grieving and they are angry, don’t make them come to you”. He needs to be made accountable, the Financial Times has mentioned that he needs to take responsibility, word is getting out there but he’s doing his usual trick of side-stepping the important issues that affect his people. 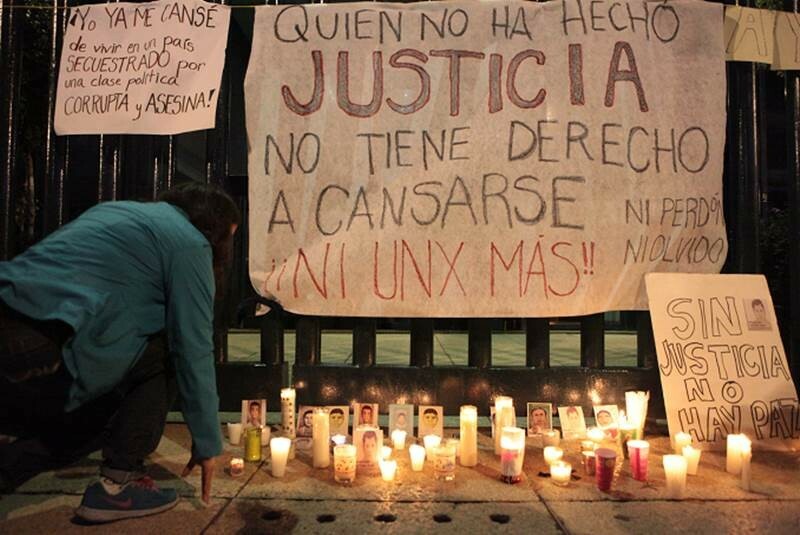 Tomorrow Mexicans will again take to the streets in mass protest against the disappearance of the 43 students, the government response, absence of justice and indignation towards the Mexican state. Pressure is surely mounting on president Peña Nieto, including in the form of this article I have translated into English below. The original from the Mexican magazine Proceso can be found here. Since he was the governor of the State of Mexico and now as president, Enrique Peña Nieto has tried to hide – placing the blame onto others – several scandals from his political and family life which, with the passing of time, have become a burden, a dark side to his career, which like a shadow follows him everywhere he goes and keeps growing bigger and bigger until it overtakes the original figure. Running across the road in the dark in my red suede high heels I know I’m going to be late. I’ve started wearing high heels to work again, at least these are comfortable so I can run. I hurriedly swipe my card at the turnstile glancing at the clock above the canteen and realise I’m ok, the time in my car is wrong. I know it’s wrong but I’m one of these people that needs to be early – it’s a compulsion. Slowing to a confident walk I hop up the stairs to the corridor where my classroom is, a messy ponytail bobbing along behind me, and flicking the fringe out of my eyes as I see my classmates waiting at the end of the corridor. I’m still here before the tutor, the room is still locked. We’ve both taken classes, after watching back-to-back episodes of the latest Modern Family box-set we realised that we watch a lot of TV. So we got out the Birmingham Adult Education Service catalogue that’s delivered to every house in the city at this time of year, and chose something to do to develop ourselves outside of work. Daniel is taking Italian in the city centre, he already speaks it a bit so it’s more of a revision to lose that rustiness that comes with lack of practice. I’ve chosen Creative Writing, it’s something I really enjoyed as a child and I thought it would be useful for my Chilanga experience. There’s a big mix of ages and backgrounds in the class so it’s always interesting to hear people’s work, and their critiques on other people’s. For some people it comes easily, for others it’s hard to be creative on demand, they need a little longer to formulate an idea before committing it to paper. We’ve had stories about a lost guinea-pig, a woman running a circus single-handedly, and a man that severs his finger but ends up growing human limbs in the soil on an industrial scale. I seem to wave between two styles of writing, one of these is quite essay-based, the other is very much “train-of-thought”. In the creative challenge at the start of the class it’s “train of thought”, over a short space of time, a window into just a few minutes of someone’s life. Winding back fifteen or even twenty years, at school we were put into different ability groups for the core subjects, I was in the top class for most of them. 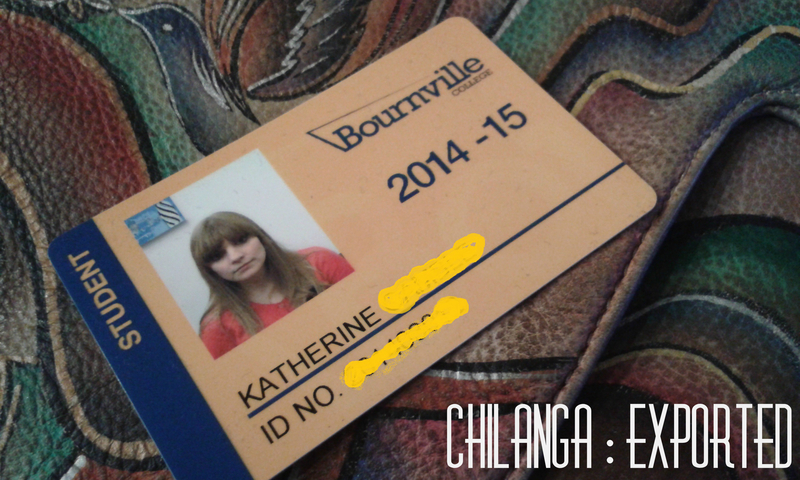 Spanish out of three, Science was five, and amazingly in Maths I was in Set 1 out of 10! The only fly in the ointment was English, I could never get up to that top set, stuck for five years in Set 2. I still enjoyed creating stories and curiously, they were mainly based in ghosts. I was really into the Point Horror series, the ghosty stories rather than the murder stories. I flirted with Point Romance, which fulfilled a teenage-discovering-myself-slash-romance-slash-physical-intimacy phase, but I always came back to the horror. Even now I can’t read a romancey chick-lit book, I need more substance than the good old will-they-won’t-they. Ghost stories always opened up a realm of impossibility where the impossible did happen. I like to think it was a precursor to my now enjoying more magical realism, or some other seemingly impossible crime or situation that seems completely normal in the novel. Where do you draw your ideas for your posts? 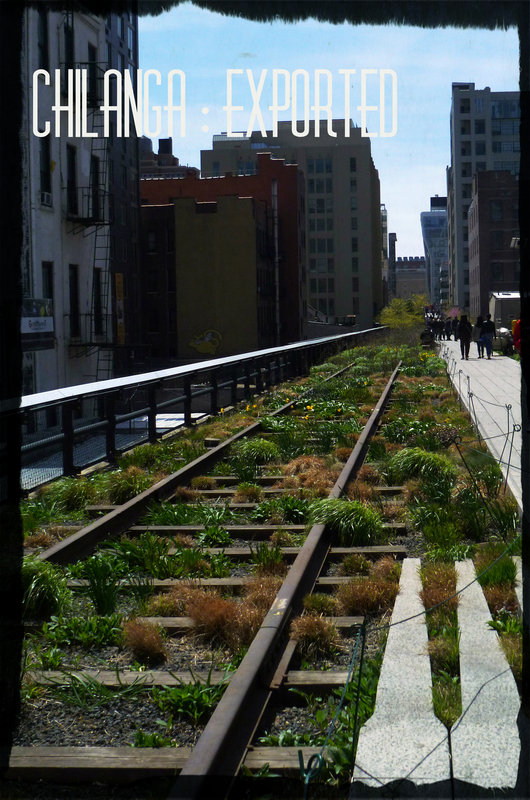 Are you naturally creative? How do you keep your mind creative? 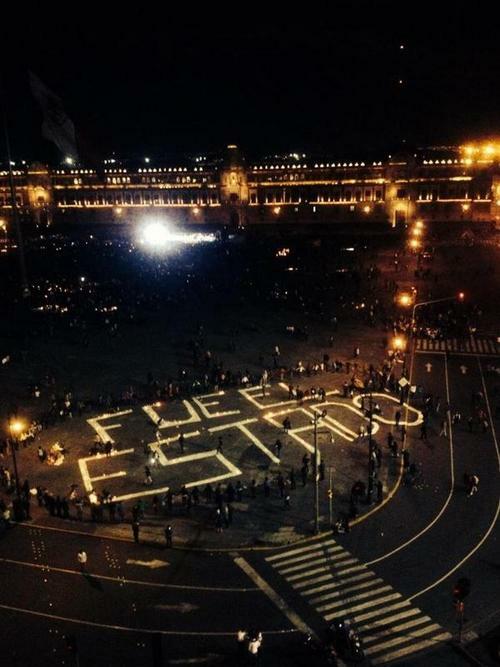 The students are declared dead, Mexico is in mourning. Shortly after I published Vivos Los Queremos, my suegrita told me of the announcement that three informants from Guerreros Unidos confessed to receiving the students from the police, killing them and burning their bodies. The three hitmen, Patricio Reyes, Jonathan Osorio and Agustín García Reyes confirmed their involvement in the disappearance. They were taken from the police cars and bundled into a truck, fifteen died from suffocation. Those that survived were taken to a rubbish dump outside Iguala, where they were interrogated and shot. According to the Aristegui article, the bodies of the students were then surrounded by tyres and wood, and burned for 15 hours until there was barely anything left to identify them. The order from their boss, El Terco, was to crush the bones and throw them in the San Juan river near to Iguala. Last week the river was a cordoned off according to The Telegraph, but no significant finds were made. On Saturday night the capital burned. 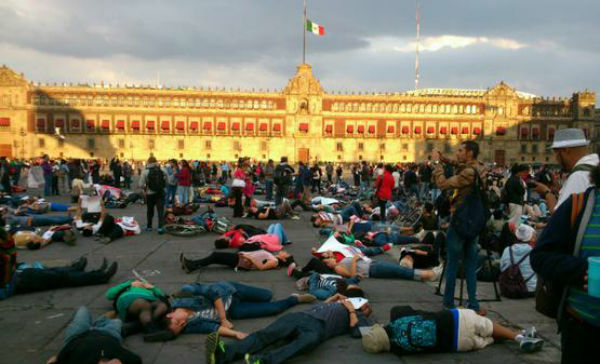 A peaceful flashmob was organised in the Zócalo at 17h00, Un Minuto por Ayotzinapa, protesters united and lay on the floor for one minute, remembering the poor students executed by the state. The peaceful protest was interrupted during the evening by anarchist groups seizing their opportunity, El Universal reports that they burned several cars and trucks, and made their way to the government buildings, successfully setting fire to the main door. Anarchists may also be to blame for a fire on the metrobus a few days ago, an attempt to distract or to justify the government’s (in)action. Where is the top man in all of this? President Enrique Peña Nieto (EPN) has not postponed his state visit to China, his country is in mourning and he has left them, there is no support from the one man that is supposed to speak out for these people. The social media demands his resignation, how dare he desert his country in crisis! He’s a master of political distraction and future promises, the United Nations have even passed comment on the president’s behaviour and so far ineffective security policies. Mexicans abroad have staged mini-protests around the world, Netherlands, Brasil, USA, China, UK, international media is taking notice and with the President out of the country he’ll find it difficult to defend himself. News has also broken recently, of a hugely expensive mansion owned by EPN, is this another attempt to distract us from the real problem here? If he’s seen to have an expensive house then it might just make us forget about the atrocity of Ayotzinapa. The Mexican government is losing, the international press is gaining knowledge and a voice, my Daniel tells me that even the journalists that usually defend EPN and his government are struggling to find a way to support his action and convince their readers of his control over the situation. With his visit to China I feel he’s left his country to cope by themselves, he’s shown he doesn’t really care about his people. Perhaps he hopes that in a country with stricter media laws he might be left alone while he formulates his empty promise official response. It’s not on the news, but six weeks ago 43 Mexican students were bundled into a bus and taken away, handed over to a local drug cartel, and nobody has found them yet. On 26th September the mayor’s wife was holding a campaign event in the southern city of Iguala. 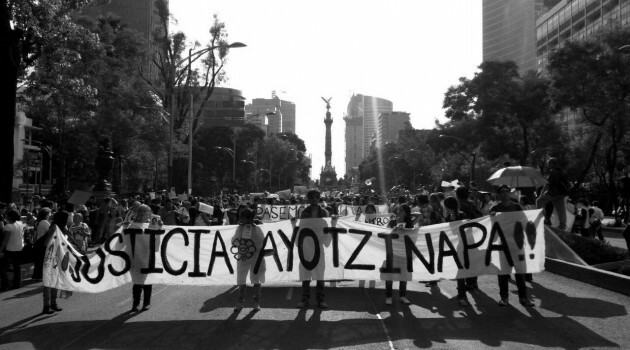 At the same time, around 80 students arrived in the city from university in Ayotzinapa to hire a bus to take them to a peaceful protest in Mexico City, also in Guerrero. As they were leaving the city, they encountered a municipal roadblock – armed state police. Shouting and shooting at their feet to control them, the police killed six people at the scene, the rest cowered in their busses or in nearby undergrowth waiting for it to be over. Forty-three were forced into police cars and taken away. Later admissions tell that they were handed over to the Guerreros Unidos, a local drug cartel. Their fate is still unknown. Alcalde José Luis Abarca – It’s well known in Mexico that most anti-government protests in the country are led by leftist thinkers, and as the college that the students were travelling from has a history of left-wing activism, it was little wonder that the mayor would want to stop them disturbing the event. The Daily Beast recounts a previous incident from 2013 where Abarca and his men intercepted a group of activists, and violently murdered them himself, and buried them in a pit outside the town. María de los Angeles Pineda de Abarca – The mayor’s wife and really the main offender here, she and her husband had been missing since the day of the disappearance. The event she was running on 26th September was building up to a campaign trail to replace her husband as mayor of the city once her husband’s term had finished. It has since become known that her brothers are part of the Guerreros Unidos and Beltrán-Leyva Cartel, the local drug cartel, and that her influence on all criminal activities in Iguala is extensive. Whether these students came to Iguala in protest or in peace, it was María de los Angeles that gave the order to “take care of them”. Guerreros Unidos – The local drug gang related to the Beltrán Leyva cartel, their calling-card is described by the Huffington Post as a gory murder leaving the victim with no face and no eyes. A banner has appeared, a narcomanta confirming their involvement in the disappearance : “Release the 22 or else we will reveal the names of all the politicians who work for us. The war is just beginning”. True to form Mexicans across the country are turning out in protest at the State’s handling of the situation. Why has it taken a month for the national forces to step in and help the search? Why is information suppressed to the point of paying people to be quiet? Why were the mayor and his wife allowed in office knowing their ties to the cartel? There are so many questions here and the people want answers. Graves have been found, but state police tampered with the evidence in the early stages so there’s no way of knowing if the bodies found already are indeed the students. Slowly slowly, across the country, other stories of similar abductions are coming out of the woodwork, Aristegui recently reported on over 300 students missing in Coahuila during the last three years, and again – nadie ha dicho una palabra. While in office, the mayoral couple had political immunity against any crimes they may commit, but on 30 September they fled their posts, renouncing this privilege. The mayor and his wife were arrested on 4th November, they had deserted their posts to hide out in a working-class area of Mexico City. As time goes on, Mexico are losing hope on their cry of “Vivos se los llevaron, vivos los queremos”. They were taken alive and we want them back alive. Government buildings have been burned, protests grow in numbers across the country, their slogan ringing out across the country. But the government doesn’t listen, not sending federal forces into Guerrero until late in October, and even then the support is minimal. Yet another tragedy in the Mexican War on Drugs. To date around 110,000 people have died since Calderón’s gung-ho declaration, a copy-cat reaction to the US War on Terror. In a society that lived in blissful ignorance of the cartels action, the deployment of the army has led to a sharp increase in civilian involvement. This student disappearance is political corruption hung out for the world to see, but the world doesn’t want to, and the government is actively working to cover up the messy part they have played. The whole of Mexico is shouting into a void, newspaper articles on page ten, buried deep in regional news on the global websites, nobody is talking about it in office canteens or in school staffrooms – it’s front page news in this country that’s shouting to the world to recognise and act. These poor souls can only be resting in the hills around Iguala, given to the cartel by two petty little people intent on furthering their own influence over the people they are supposed to serve.